I’m delighted to be exhibiting at the Slaughters Manor House Wedding Show as one of their recommended wedding photographers. 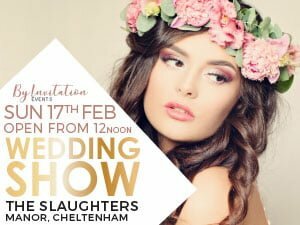 The show is being held at the perfect setting for a stunning and romantic wedding, The Slaughters Manor House in arguably the prettiest village in England. You will be spoilt for choice with premier wedding suppliers to speak too. You can find it all here and it’s FREE ENTRY with a FREE welcome drink. One lucky couple will have the chance to winner a luxury overnight stay for two which includes afternoon tea and dinner at The Slaughters Manor. There will be a golden envelope inside one of the 50 goodie bags given out at the wedding show.